Below is a rather big GPS map showing that the road from the Montrose Adobes to the Peach Valley area is open. There used to be a rather large “in-holding,” meaning private land surrounded by BLM. The main road travels right through this in-holding, so getting from the Montrose Adobes to the Peach Valley area meant using the Slanty Bridge trail (see here for my personal Slanty Bridge fiasco). Well, the BLM traded some land, so this in-holding is now BLM property and the gates are open. The GPS map (you’ll have to click on “read more”) shows how to get from 6530 Road (the access to the Montrose Adobes from Montrose), all the way to Chukkar Road in the Peach Valley area. Elephant Skin Road now goes all the way through the old in-holding: the gates are now open. Note that 6530 Road becomes Elephant Skin Road, which now winds its way around into the southern part of the Peach Valley area. 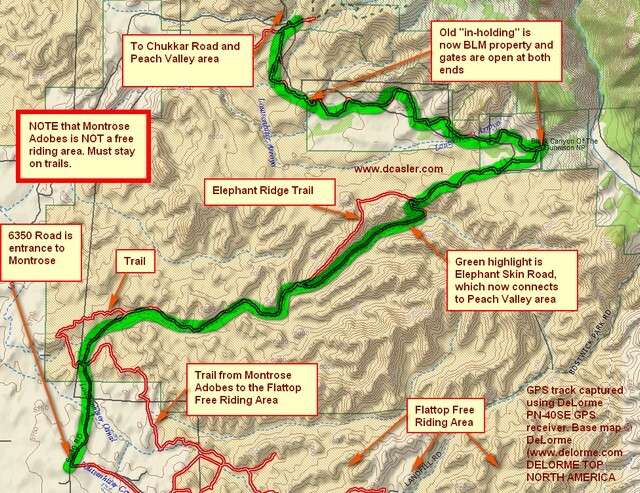 This entry was posted in Montrose County, Motorcycling and tagged Elephant Ridge Trail, Elephant Skin Road, Gunnison Gorge National Conservation Area, montrose adobes, Peach Valley. Bookmark the permalink.